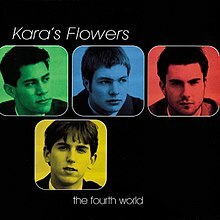 The Fourth World is the only studio album by the Los Angeles band Kara's Flowers, who later achieved greater success under the name Maroon 5. The album contains 11 tracks, plus one bonus track on the Japanese edition. The band, which had previously self-released an album called We Like Digging? (1995), signed with Reprise Records and released The Fourth World album on August 19, 1997. However, the band had little success with the album and parted with the record label a year later. The band continued to explore different musical styles until finally coming together again with James Valentine under the name Maroon 5. The only single released from the album was "Soap Disco", released July 22, 1997. A music video was produced for the single, depicting the group walking through a park and performing in an orange and green room. A storm appears at the end of the video. The video was directed by Mark Kohr (who has directed music videos for Alanis Morissette and Green Day). The band made an appearance from the television series Beverly Hills, 90210, where they performed the song in the episode "Forgive and Forget". Giving the album a B+, Tom Lanham with Entertainment Weekly said the "optimistic, lyrically awkward kids spend 10 more happy tracks turning the tables on lethargic slacker cynicism, with Green Day producer Rob Cavallo bridling all that youthful zeal." All tracks written by Adam Levine, Jesse Carmichael, Mickey Madden and Ryan Dusick, except where noted. ^ "Kara's Flowers – We Like Digging? (1995)". Retrieved May 25, 2018. ^ VH1.com: Kara's Flowers Artist Page Accessed August 18, 2007. ^ allmusic: Kara's Flowers Accessed August 18, 2007. ^ "Adam Levine's First Band, Kara's Flowers, Appeared on What '90s Drama?". Wetprint. Retrieved August 11, 2018. ^ Moll, Susan (January 2005). "Kara's Flowers: The Fourth World". Pitchfork. Archived from a dead link on November 2, 2005. Retrieved July 29, 2018.